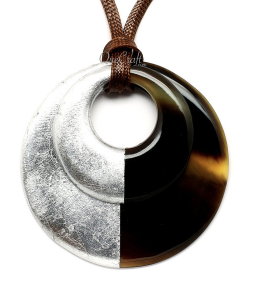 My favourite jewellery category by necessity, Relaxed Real is artisanal jewellery that uses noble metals, natural stones or other organic materials—and I make room for resin. They are not the branded production pieces sold in department stores. The appeal of such jewellery depends on solid design skills. I am not showing chance finds from thrifts or rummage sales, wonderful as they are, because I want you to be able to buy them, should you wish. Lots of treats cost about that: a new book or two, a mani-pedi, some cute Ikea kitchen stuff. At this price you can find chic and witty pieces, but not necessarily things that will be handed down. Why fret about posterity? On raw and dreary days, these will lift your mood and enliven even your most tried-and-true sweater. Buffalo horn and silver lacquer pendant from quecraft, about $25. 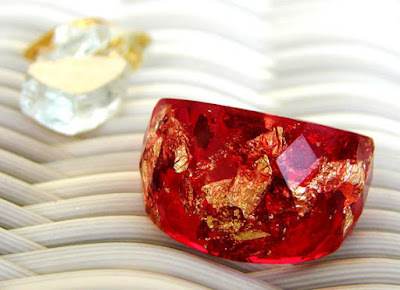 Red resin ring infused with gold leaf, from ResinHeaven USA, about $23. Kintsugi is a Japapnese technique of mending a fissure or other damage with precious metals (or materials that resemble them). 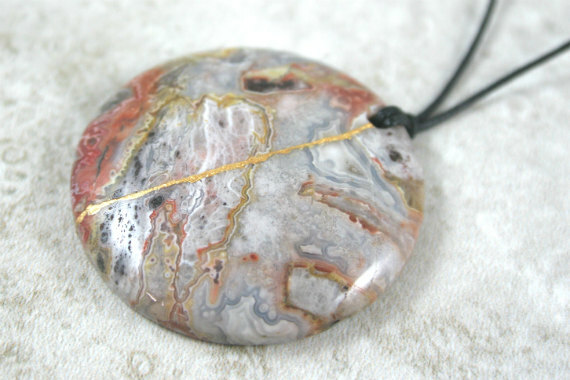 Above, crazy lace agate pendant with kintsugi, on black cotton cord, from AKintsugiLife; about $35. 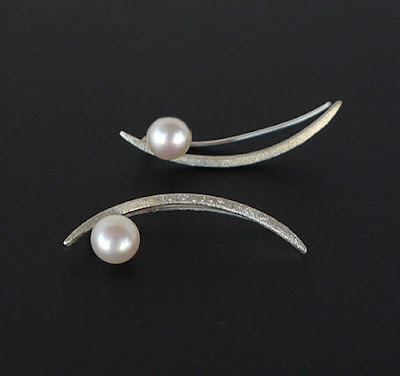 From Greece, kalyoso silver's pair of genuine pearl and silver 'climber' style stud earrings; about $34. Also available in gold plated silver. Who doesn't want to get away? Berlin city map bangle: decoupage over wood, weather-proofed; by PappLePapp, about $29. Also available: London, Paris, Vienna, New York and more. If your'e looking for a gift, buy one now because when the moment arises, you will have it on hand... if you can resist wearing it yourself! Sorry to digress but just wanted to ask people if they are having problems linking to The Vivienne Files today? I know that Janice reads this blog so just wanted her to know - that Blogspot says it doesn't exist - wants to redirect me but says it hasn't been checked for virus' or blogware. A similar thing happened to one of the UK bloggers I follow last week - it seems as those somehow she has defaulted to an old name and some weightless co. in the US has taken over her UK blogging address - and she has no idea how or why this has happened. Margie: I can hit The Vivienne Files by bookmark, and it is also coming in on my rss feed. Sorry - meant to say - love the city bracelets - what a great idea to have a collection of all the places you've visited. I love that you show all price points and understand that not everyone can spend thousands (or even hundreds) at a time - but it's still lovely to have something just that little bit different! 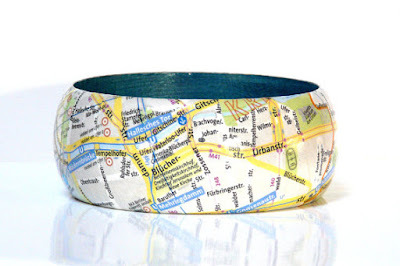 I love the city bracelets as well - they'd be very popular among urbanism enthusiasts! I like the horn jewelry by Quecraft, some off which reminds me of the horn items made at Hermes. And I also like the Kintsugi pendant. These pieces are so much more interesting than what's in my local department store! BTW, I also had trouble getting to Janice's website this morning. I love all of these ideas - and I've been out of town in areas without internet service, so I was unaware of these problems. Ah, the joys of computers, eh? Margie: Several of my most-worn pieces are very modestly priced finds: a secondhand Modernist sterling and malachite ring that was $65, and an abalone cuff from a friend who found it in Mexico. But as price point drops, the durability does too, so I usually recommend avoiding things like elastic stretch bracelets. Sewing: They reminded me of Hermès' too- and at a fraction of the price. Very chic- check out their other pieces. Department stores do not carry handmade jewellery unless at the fine jewellery level, and then, usually status brands, so you're paying the "brand tax." I look, but in the last 15 years or so, have not bought. I love all of these, and am off to check out that resin ring!